Den poezie is an annual international and multicultural poetry festival held for two weeks every November around the birth anniversary (16.11.1810) of the great Czech Romantic poet, K.H. Mácha. It is the most widespread poetry event in the country with events now taking place in over 50 Czech cities, towns and villages. Almost all the events are free. This year’s Den poezie runs from 11th – 25th November and its theme is Nebát se / Don‘t Fear (from a famous quotation by the first president of Czechoslovakia, T. G. Masarýk, Nebát se a Nekrást – Don‘t fear and don’t steal). In the 2018 programme there are two events in English – on Wednesday, 14th November at 7 pm in the library of Anglo-American University, Letenská 1, Prague 1 there will be a reading by poets Stephan Delbos (US) and Michael O’Loughlin (Ireland). The second event is a multimedia performance on Saturday 24th November at 19.30 at the Skautský institut, Staroměstské nám. 1/4 featuring poets and artists from the US, Iceland, Taiwan and Russia. There will also be bilingual readings by the Scottish poet Alan Spence at a joint reading on Monday 19th at Cafe Elektric, Ovocný trh 6, and by Irish poet Michael O’Loughlin on the literary walk on Sunday 11th November, which starts at Karlín metro at 16.30. Or if you would like to read some of your own poems in English, you can join the gathering at the statue of K.H. Mácha on Petřín Hill on Friday 16th November at 19.00 where everyone is free to read. Den poezie first took place on just one day in 1999, and marked the launch of a Poezie pro cestujíci (Poetry on the Metro) project initiated by the festival founder, the Literary and Cultural Club 8 (Renata Bulvová and Bernie Higgins). The festival is now coordinated by the Poetry Society (Společnost poezie), a small group of people involved in literature/teaching who work as volunteers to organise events and promote interest in poetry. Year by year, the length of the festival extended, as more and more organisations and towns participated until it reached its current two-week duration. As well as readings by well-known Czech poets, such as Sylva Fischerová, Petr Borkovec, Petr Hruška etc, thanks to the support of various foreign cultural institutes the festival also features leading poets from abroad. This year the festival will have poets from Belgium, Croatia, Denmark, France, Hungary, Ireland, Palestine, Poland, Scotland, Slovakia, Slovenia, Spain, and many other countries. The festival also celebrates poetry from the Czech Republic in languages other than Czech, e.g. in Lusatian and Romani. Readings are in Czech or in another language with Czech translation. 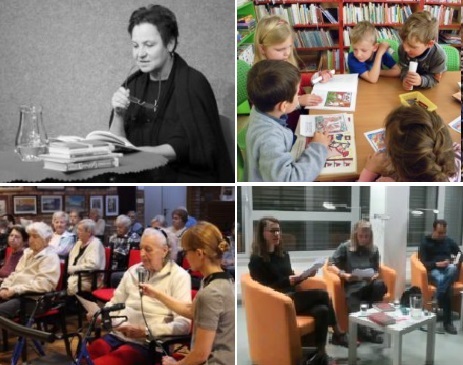 Events are organised by schools, libraries, universities, literary groups, clubs, theatres, museums and individuals as well as by the main coordinators of the festival, Společnost poezie, who organise a central programme and coordinate publicity for all the national events. The regional reach of Den poezie is important and the festival aims to inspire the widest possible involvement, encouraging the celebration of poetry in many forms – not only through readings, but also through music, theatre, art, film and ‘happenings’. We consider one of the festival’s strengths to be its range of participation, from well-known, published Czech and foreign poets to schoolchildren learning to enjoy and create poetry for the first time. In 2016, the festival saw the launch of a new project, Poezie pro čekajíci (Poetry for People Waiting). It involves providing poetry brochures to places where people wait (hospitals, official offices etc.). In 2018 we are launching, along with the Prague City of Literature, a new ‘City Poet’ project, which will appoint a poet annually to serve as an ambassador for poetry in the city. The first Poet of the City of Prague for 2019 will be the great poet Sylva Fischerová. The Poetry Day festival is mainly supported by the Czech Ministry of Culture, the Prague Town Hall and the Czech Literature Foundation. Foreign cultural institutes in the Czech Republic give support by sponsoring the participation of poets from their countries. A number of smaller organisations support us mainly through providing publicity. The festival also receives good press coverage, in local and national newspapers, radio and television. Our deadline for submitting information about events is September 15th each year.